The south-east Dorset town of Poole sits on the northern shore of a large natural harbour often claimed as the largest in Europe. The harbour is separated from the ocean by a sand-spit known as Sandbanks, an exclusive residential enclave famous for its property prices. Poole forms the western part of the south east Dorset conurbation merging seamlessly with its neighbour Bournemouth to the east although the two town centres are some five miles apart. Poole is a largely urban authority and is a unitary authority meaning that the Borough Council handles all local authority functions including all responsibility for planning and transport. Development Plan:The principle document is the Core Strategy adopted in 2009. These are joined by the Site Specific Allocations and Development Management Policies DPD and the Delivering Pooles Infrastructure DPD. The 2004 Local Plan is almost completely superseded (the random exceptions being: T12 – Coach and Lorry Park, E1 – Employment Land and CF1 – School Sites). Pre-application advice: Poole charges for this service – initial fees are adverts and householder £56 inc VAT, minor applications £255 inc VAT, major applications 10% of the cost of the planning application +VAT. Additional officer time for meetings is £66 inc VAT per half hour. Call us for advice on whether this service is worthwhile in your case. Affordable Housing: The national threshold of 10 units (or 1000 sqm) is applied. For applicable schemes of 6-10 units (i.e. over 1000 sqm theshold) a formula is applied to create a financial contribution. This uses a Community Infrastructure Levy style tariff per square metre which varies from £33 per sqm to £89 per spm depending upon the area. Above 10 units 40% onsite provision will be expected. Viability cases can be made to reduce or remove affordable housing and, unlike Bournemouth, Poole does not charge applicants trying to make such a case. A few areas of the Borough are within 400m of heathlands sites where no additional residential units are allowed. The Council seeks to prevent the loss of tourist accommodation anywhere within the Borough. The countryside area north of the town is all Greenbelt. In addition to the large Branksome Park Conservation Area the eastern coastal area is littered with small conservation areas. 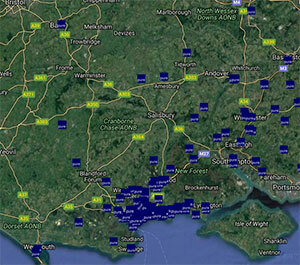 Flood risk is a significant issue in many harbour-side areas including Sandbanks.